The cane corso is a large-boned and muscular working dog with a noble and confident disposition. Cane corsos are powerful dogs that may seem intimidating to some. These fearless and vigilant dogs are not right for everyone. However, they are often misunderstood and can actually make excellent companions. For those who like the idea of a very large dog that is protective and athletic, the cane corso is one to consider. You should first know that the name of the cane corso is pronounced "KAH-Nay KOR-So." This is a commonly mispronounced breed name. Coat and Colors: Cane corsos have a short, coarse coat. Colors are black, gray, fawn, and red; brindle is possible in all colors; may have black or gray mask; may have small patches of white. The cane corso originated in Italy and can be traced back to ancient times. 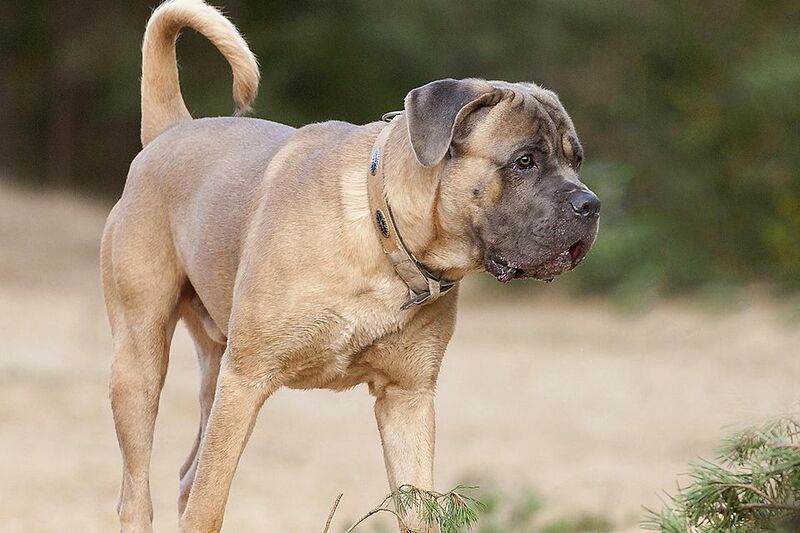 The molossus, a now extinct mastiff-type dog, is an ancestor of the cane corso and similar mastiff-type dogs. Throughout its early history, the cane corso acted as a guard dog, war dog, and skilled hunter of various game (including very large game). Its name is derived from the Italian word for dog, cane, and the Latin term cohors, which means "protector" or "guardian." A significant decline of the cane corso breed was brought on by World Wars I and II, but small numbers of the dogs still existed. In the 1970s, cane corso enthusiasts sparked a revival of the breed. The first cane corso dogs arrived in the U.S. in 1988. The breed was admitted to the AKC miscellaneous class in 2007 and received full recognition into the AKC working group in 2010. The cane corso has a short, coarse coat and is typically just a light shedder. Grooming needs are very basic—occasional brushing and bathing as needed. Like other large dogs, the cane corso might have nails that wear down naturally. However, occasional nail trims may be necessary. Be sure to check the length of your dog's nails on a regular basis so he can remain comfortable and mobile. The ears of the cane corso are often cropped into an equilateral triangle, but this is not a requirement according to the breed standard. The tail is typically docked at the fourth vertebra. A true working breed, the cane corso is active and driven. Daily exercise will help keep your cane corso physically and mentally fit. Brisk walking or jogging for at least a mile is a good place to start. If you don't have a job for a cane corso to do, he might find his own and end up digging holes and chewing on your belongings. If you have a farm, he can herd livestock. But if you are a more typical homeowner, spend time each day with a dog sport, learning tricks, or practicing obedience skills. A cane corso is best adopted by a person who is familiar with dog training rather than a first-time owner. Proper training and socialization are essential for all cane corsos. With a natural aversion to strangers and a tendency to be territorial, you must be diligent and consistent while training. This is also crucial because of the dog's giant size; careful attention should be placed upon prevention of jumping, leaning, and leash-pulling. The cane corso is intelligent and hard-working, so it should not be difficult for this breed to learn. Despite its appearance, which some might find intimidating, the cane corso can actually be affectionate and gentle. This breed will bond deeply with its family and act as a protector. With proper handling and socialization, the cane corso can get along well with children, even forming a close bond. However, those children must also be taught how to behave around dogs and never left unsupervised. A cane corso needs a sturdy, high fence when being allowed outdoors. The breed has a high prey drive and is prone to chasing and killing small animals such as cats and other dogs. They are territorial and will patrol the fence line protecting the property from passersby. Gastric dilatation-volvulus: This is bloating after eating and drinking too fast. If the stomach twists, it can cut off the blood supply and create a medical emergency. Eye defects such as ectropion, entropion, and cherry eye may occur. An adult cane corso will need 4 to 5 cups of dry dog food per day. It's best to divide it into two meals to help reduce the risk of bloating and stomach torsion. Be sure to assess whether your dog is getting overweight. If you note weight gain, discuss with your veterinarian whether you need to change the feeding schedule, amount, type of food, and exercise routine. If you think the cane corso could be right for you, try to locate cane corso breeders and owners in your area so you can spend some time with the breed first. Also, consider searching for a cane corso rescue group to adopt one. Make sure you understand what is necessary to properly care for this breed before you bring one into your life. If you’re interested in similar breeds, look to these to compare the pros and cons.